Montezuma County’s Annika Lewis to represent rural Colorado in N.Y.
A 15-year-old from Montezuma County hopes to leave an impression on the corridors of power next month at the 2018 session of the UN Commission on the Status of Women. Scheduled for March 12-23, it will be the 62nd meeting the commission has held at the UN headquarters in New York. Each year, the commission has a different theme related to the well-being of women and girls all over the world, and this year the focus is on gender equality in rural areas. Annika Lewis, a 10th-grader at Montezuma-Cortez High School, will join a delegation from the Episcopal Church to the commission. In addition to the commission’s members, who include about 45 UN representatives from around the world, delegations from faith groups and nongovernmental organizations visit the conference every year to provide their perspective on women’s issues. Annika, one of the youngest members of her delegation, will represent rural Colorado and the Episcopal Church. The beginning of a journeyAnnika’s journey to the UN started several years ago, when her family was going to a church in Arizona. After her family moved to Cortez, Annika’s discontent with the Bible-based doctrine of male leadership in the church grew. She said she decided to join St. Barnabas Episcopal Church when she was about 12, after she found out the pastor, Leigh Waggoner, was a woman. In August, Waggoner encouraged Annika to answer a request from Lynnaia Main, the Episcopal Church representative to the UN, for women and teens from rural areas to help represent their church at the commission. She was accepted in November, along with 19 other delegates from around the world. Since then, much of Annika’s time outside of schoolwork has been taken up by conference calls with other delegates, plans for the trip and research on issues facing women in places like Montezuma County. Once they reach New York, the delegates will form teams that will each discuss a problem and possible solutions. Annika plans to join the team dedicated to exploring education and leadership opportunities for rural women. Learning from women at homeAs part of her research, Annika gathered stories from Montezuma County women and girls. In December, she met with seven women who hold various leadership and public service roles in the county to hear their thoughts about being female in rural Colorado. All seven agreed that things have gotten better for leadership-minded women over the past few decades, but Montezuma County still has work to do. Some of the speakers pointed out that Montezuma County’s population of female leaders, business owners and public servants is growing. Mancos and Cortez have female mayors, and all the county’s municipalities have female staff. The Mancos, Dolores and Cortez Chambers of Commerce are run by women, as are many charity organizations such as the Bridge Emergency Shelter, whose executive director, Laurie Knutson, attended the meeting with Annika. Knutson said she believes prejudice in the county has shifted away from women in general, and now targets people of both genders who have “too many needs.” Women in poverty or poor health are often marginalized and denied opportunities to better themselves, she said. Debbie Meyers, a retired nurse, added that access to health care can be difficult for rural women. She said it can be especially hard for young mothers who are still in school, because most Montezuma County schools don’t offer child care for students. Education is also an issue, she said, since many rural girls don’t have college degrees, which limits their career options. After listening to Montezuma County women, Annika said her highest goal is to help her fellow teen girls realize they have a future. Gaining a world viewIn New York City, Annika and other delegates will be busy. She said they plan to spend about eight hours per day in meetings with UN representatives, listen to speeches about problems rural women face, network with people from around the world to set up mission work with the Episcopal Church and advocate for their own and the Church’s views on each issue. Annika’s nervous about becoming an advocate but said she’s working on ideas to take before world leaders. She believes that successful women can help girls learn about opportunities, and back home in Montezuma County, she hopes to organize a series of talks by women in leadership positions. She plans to share her ideas, along with the stories of people in Montezuma County, during the conference, but it will be expensive. She said the Episcopal Church paid for some of her expenses, but she estimated she’ll need about $2,000 to cover food and travel for the trip. On Wednesday, Waggoner set up a GoFundMe account to help her raise that money. Her mother, Tegan Lewis, will be her chaperone for the first week, but Waggoner will take over for the second so Lewis can go back to work in Cortez. Her father, JJ Lewis, will stay home. 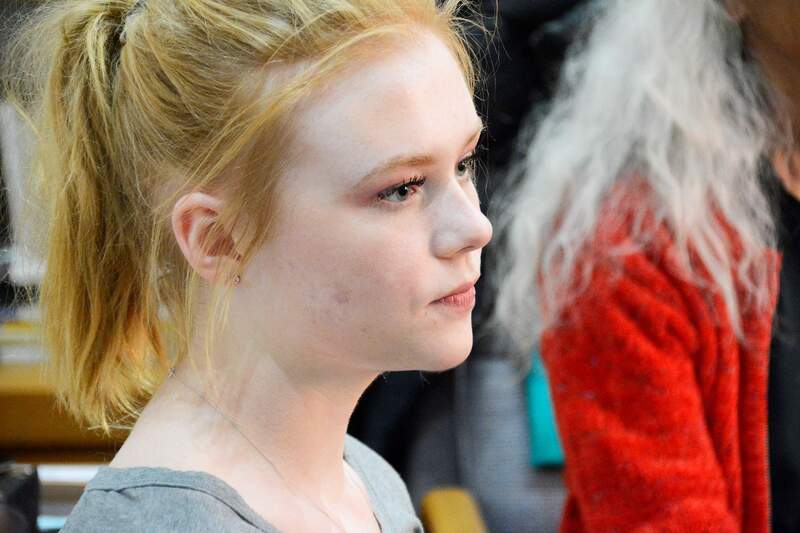 Annika has never been to New York and looks forward to learning from international leaders. 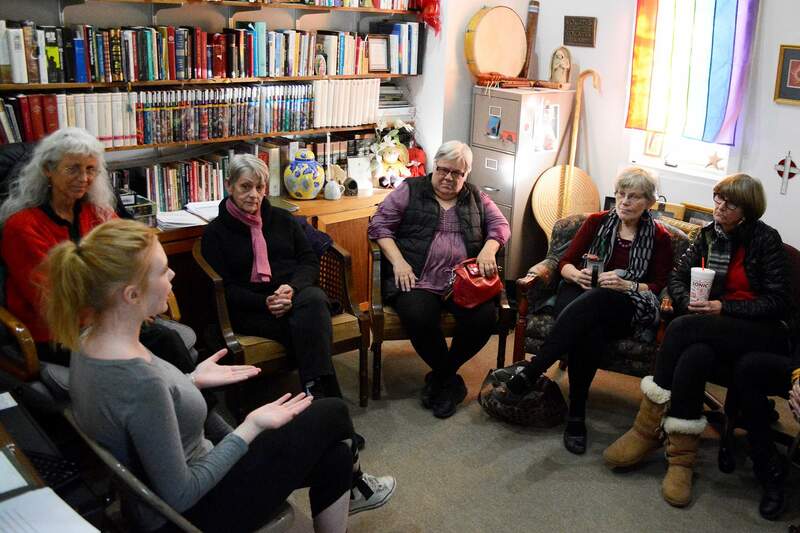 Annika Lewis listens on Dec. 15 as local women share their experiences of living in Montezuma County. To learn more about this year’s session of the UN Commission on the Status of Women, go to www.unwomen.org/en/csw/csw62-2018. St. Barnabas Episcopal Church’s fundraiser for Annika Lewis can be found at www.gofundme.com/un-status-of-women-trip. Annika Lewis discusses her upcoming conference at the United Nations with residents in Montezuma County.